For sale is my 365g acrylic aquarium. Dimensions are awesome at 10’Lx3’Wx20″T. Dual center overflow to a 75g sump housing a Bubbleking Mini Skimmer ($1200 new) with a Reeflo Dart return pump. 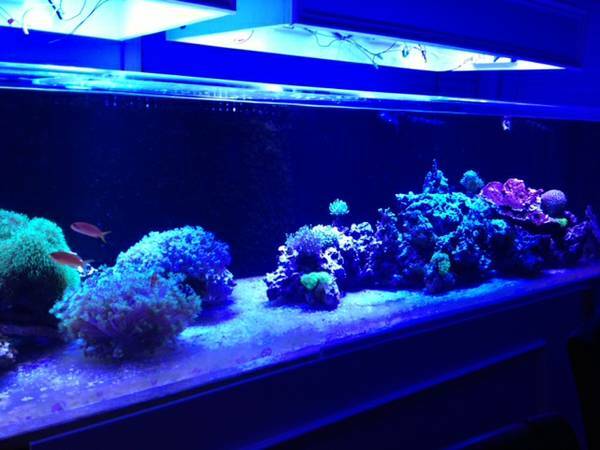 DIY LED lights provide ample lighting for all types of corals. Heavy duty stand included. Tank has some minor scratches but nothing more than to be expected from a used acrylic tank. Don’t miss this rare opportunity to own a huge aquarium at a fraction of the cost. The lights and skimmer alone cost more than $3000 new. New job doesn’t allow me enough time to maintain and enjoy the tank like I used to. Ready to go. Corals and fish are gone.